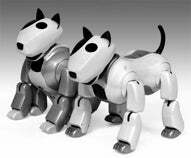 Do androids play with electric dogs? Nothing says the future like robotic pets. Well, maybe jet packs. And flying cars. Okay, lots of things say the future, but how many of them are here now ? Robotic pets are great. No shedding, no allergies, and best of all, no housebreaking . Plus, there's nothing like cuddling up next to your robo dog next to a roaring fire—just don't get too close. But there's been something of a void since Sony announced the end of their iconic AIBO line, a void which is now being filled by Korean vendor DasaTech's new totally-different-from-AIBO-we-swear Genibo. Genibo is a real live robotic dog who will run, jump, play dead and fetch your slippers, all the while planning and scheming for the inevitable robopocalypse, when they will fetch your doom . Genibo will be available sometime next year.